Description: Billy, Charlie, and Tom are inseparable, and for good reason. Filled with con men and scoundrels, London’s East End is not easily survived alone. Fortunately, the three friends—and their faithful feline companion—can count on the protection of Sherlock Holmes, for whom they sometimes act as spies. Review: The Baker Street Irregulars from Sir Arthuer Conan Doyle's Sherlock Holmes stories get their very own graphic novel series, Baker Street Four, from France. For those unfamiliar with the Baker Street Irregulars, they are a group of poor, usually homeless and orphaned, kids with incredible street smarts that assist the great detective by being his eyes and ears on the seedier side of London. The graphic novel focuses on three irregulars, Billy, Tom, and Charlie, and their two adventures. 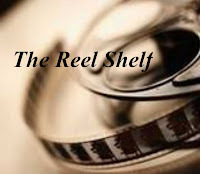 The first story Tom's girlfriend is kidnapped by a pimp and sold to a brothel. The trio spring action to rescue her with the help of a new teammate. In the second story, Holmes is decoyed out of England so that the Okhrána, the Tsar's secret police, can wipe out a nest of Russian revolutionaries escaped to London and the whispers of Jack the Ripper has begun a new string of killings. The Irregulars fill in Holmes's shoes to help Russian radical Katya uncover the informer and foil the Okhrána's dark plans. This was an okay graphic novel but it didn't stand out for me. I was hoping for more character development of the trio but we get bits and pieces about them but nothing is fleshed out. While the illustrations are nicely bright and colorful with lots of period detail and not mincing on the seedier underbelly of Victorian England, I had a hard time sometimes distinguishing the genders of the characters. They looked a lot alike. The illustrations took up too much room in the panels and dialogue box were placed above the characters and at times it was difficult to figure out who was speaking. I was also disappointed that we don't get to see much of Holmes and Watson. They only briefly appear in a few panels in each story. I don't think I will be continuing this series, but I will continue to look for Sherlock Holmes related graphic novels. Words of Caution: There is mild language, allusions to prostitution, and scenes of a brothel in the book. Recommended for strong Grades 8 readers and up. 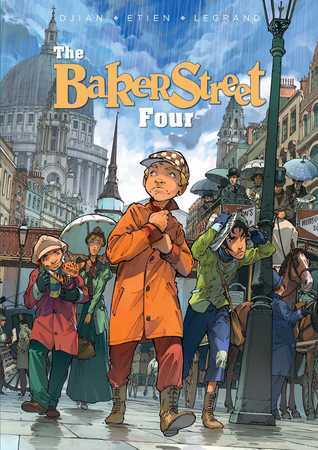 If you like this book try: The Baker Street Four, Vol. 2 by J.B. Djian and if you are looking for graphic novels where Sherlock Holmes plays a prominent role try The Sign of Four by Ian Edington, On the case with Holmes and Watson series by Murray Shawn. Too bad this one didn't live up to expectations or potential!